Susan and Charles Booker created a modern space with a lap pool|! !| a charming covered porch|! !| and a larger patio in their somewhat diminutive Uptown backyard. Gulf Coast Pools and Alvarez and Basik landscapers worked with the couple to achieve their vision. In lieu of a lawn|! !| an outdoor rug designed by The Novogratz is placed on the patio. 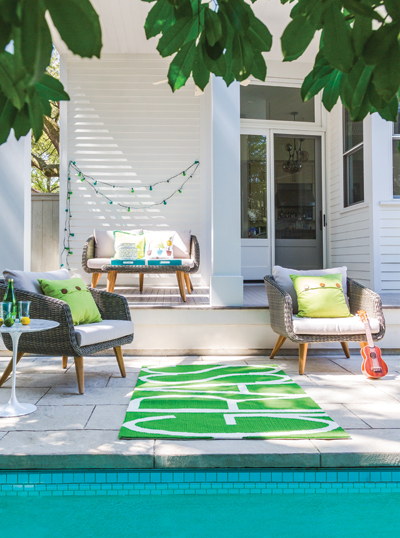 Summertime (and year round) outdoor living is a given in New Orleans. Many homeowners create an outdoor living space, facing the challenge of the unique shape of city lots that permeate the area. Pools, patios or courtyards are hidden treasures, often glimpsed through an open gate or a thick hedge of greenery. Layouts can be a simple charming space created by using outdoor furniture, potted plants and an overhead string of lights, all nestled into a compact footprint. Others are more elaborate with swimming pools, lush landscaping, outdoor kitchens and dining areas, plus multiple outdoor seating situations as plush as anything found indoors. Style knows no limits in this collection of the urban oasis, because after all this is the visual banquet of individual expression that is distinctly New Orleans. Architect and interior designer Lee Ledbetter and his partner Douglas Meffert live in an iconic mid-20th-century modern home, a rare gem Nathaniel C. Curtis designed for himself. The house has an impressive number of courtyards and water features. The homeowners have kept to the spirit of the house by using vintage midcentury outdoor furniture, including pieces by the designers Billy Haines, Salterini and Knoll, all culled from years of collecting. Landscape designers Luis Guevara and Aaron Adolph created the lush hidden gardens. Alexander Pools designed the fountains. Mickey and Melanie Loomis’ backyard in Old Metairie has room for a small pool, a covered dining area and outdoor patio space. Landscaper Patrick Grimley installed the lush faux grass lawn for low maintenance, and as an ideal play space for the children. Shaun Smith Home did the furnishings with a chic and clean black-and-white palette, using fabrics and textiles that are weather friendly. “Our outdoor area is great for entertaining and relaxing,” says Melanie. “But, [it] is mostly used as a playground for the kids, with lots of creative ways to hide all of the toys. Artist David McPherson renovated and restored a French Quarter property. He says the outdoor space “is a collection of small courtyard spaces that feel very comfortable and flow well. It doesn’t feel cramped at all. I like that it has multiple seating and dining areas.” He is a home gardener, and did the planting himself. The plants are from American Aquatic Gardens, Lowes, Home Depot, The Plant Gallery and Harold’s. Larry and Julie Robinson have an unusual outdoor space on either side of their Irish Channel cottage. Both spaces are driveways, with one being dedicated as the patio off the side entrance and porch at the back of the house. Julie is an avid gardener who loves to buy plants at Urban Roots. Affordable furnishings are vintage. Pots, hanging baskets, and lights strung overhead all add up to a charming space the Robinsons use for entertaining.